What Kind of Problems Can Result From Crooked Teeth? If you have crowded or crooked teeth, or an issue with your bite, you may have bigger problems than aesthetics alone. A lack of self-confidence about laughing and smiling. This can adversely affect every area of your life! An inability to keep your teeth and gums clean. Crowding creates the perfect hiding place for plaque and bacteria, which can be hard to access with your toothbrush and floss. Issues with your TMJ or jaw joint. Essentially, this type of orthodontic treatment works on the same principle as regular braces. Gentle pressure is applied to the teeth until they move, bit by bit, into their correct positions. When the final result is achieved, the teeth are “held” there with retainers. 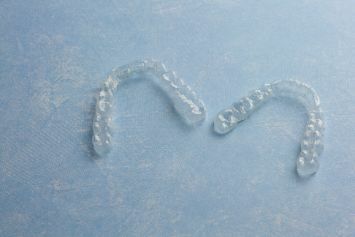 The biggest difference is that thin, comfortable plastic trays, called clear aligners, are used instead of brackets and wires. No one will be able to tell you’re in treatment and you won’t have uncomfortable metal in your mouth! While scheduling a consultation is the best way to determine whether this treatment will work for you specifically, here are several factors that can give you a rough idea of whether you’re a candidate. First, Invisalign tends to work better for adults because their jaw bones and facial structure are fully developed. Also, generally speaking adults tend to have more success because they’re more disciplined about wearing their clear aligners. They must be worn for a bare minimum of 20-22 hours per day to work properly. That leads to the second requirement, which is that you can realistically commit to wearing the aligners as recommended throughout your treatment. If there’s any reason you may struggle with that, traditional orthodontics may be more effective. Finally, while Invisalign works for a wide range of cases, if you have particularly severe crowding or bite issues you may need braces instead. The only way to know for sure is to be evaluated by your dentist! With the long list of advantages you’ll enjoy with this option, why not find out if it can work for you? Dr. Gary Henkel has been practicing dentistry for nearly 40 years. In that time he has become a highly sought-after speaker and lecturer in a number of specialty dental fields, as well as a faculty member at the University of Pennsylvania. He combines his years of expertise with a reassuring chairside manner to give his patients an outstanding dental experience. He can be reached for questions via his ‘Contact Us’ page on his website, or at (215) 672-6666.